A few weeks ago, I had the opportunity to participate in a two-day health program at Mayo Clinic in Rochester, Minnesota. My goal was to maximize my capacity to be fruitful and effective as an episcopal leader by investing in my physical, mental, emotional, and spiritual health. My experience was unlike anything I could have imagined! 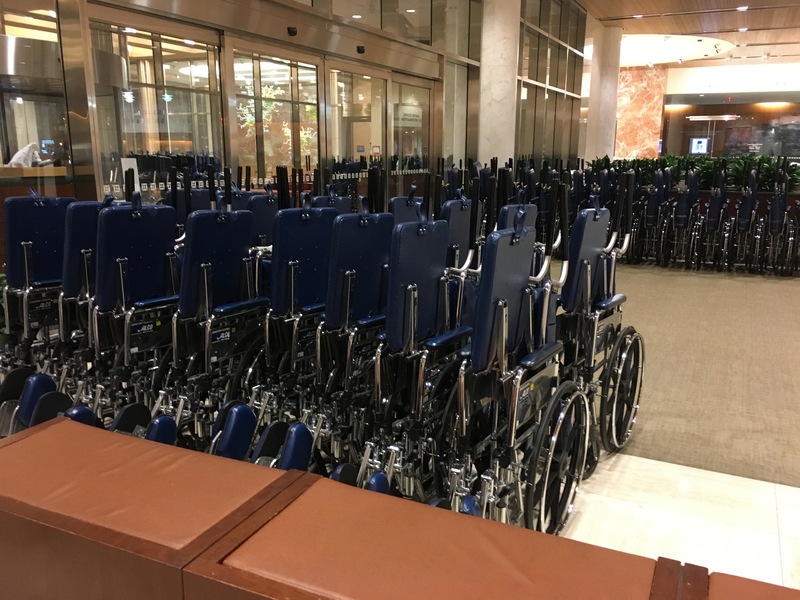 Dozens of wheelchairs were lined up outside the main building at 6:30 a.m., waiting for the arrival of hundreds of patients from around the world. Every year 1.3 million people from all walks of life as well as every state and 150 countries visit one of the various Mayo facilities, most as outpatients. In 2016-17, Mayo Clinic, Rochester, was ranked as the #1 overall hospital in the United States by U.S. News & World Report. William Worrall (WW) Mayo came to Rochester, Minnesota in 1863 as an examining surgeon for the military draft board during the Civil War. After the war was over, Mayo opened a medical practice, and his sons William James (Will) and Charles Horace (Charlie) followed in their father’s footsteps. August 21, 1883, was a defining moment in Rochester and in the Mayo family. A tornado destroyed one-third of the town, resulting in thirty-seven deaths and over two hundred injuries. The Mayo family escaped serious harm, and W.W., his son Will, and other doctors set up a temporary hospital in the city dance hall. Called in to serve as nurses were Mother Alfred Moes and the Catholic Sisters of St. Francis, who had no medical training. 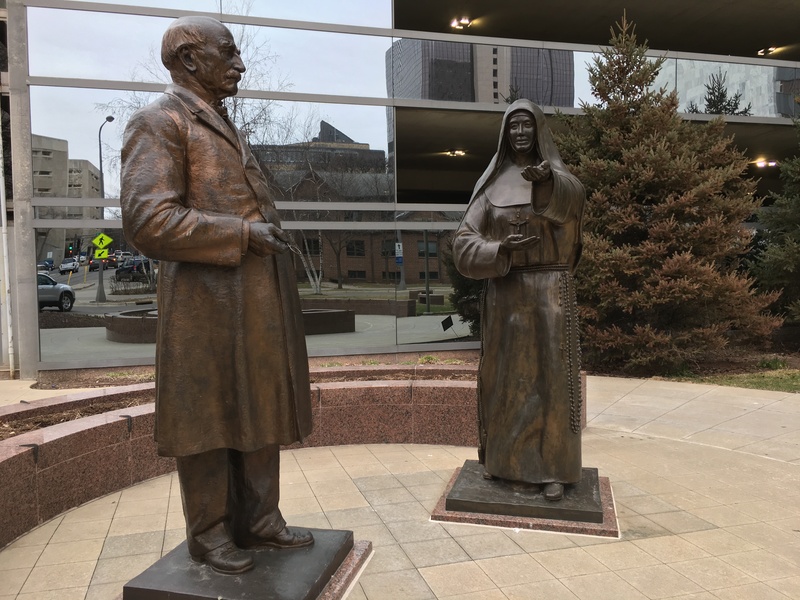 Mother Alfred Moes subsequently suggested to Dr. Mayo that she and her sisters would fund and build a hospital in Rochester if Dr. Mayo and his sons would serve as the staff. St. Mary’s Hospital opened in 1889, and an addition followed five years later. W.W. Mayo, who was seventy years old at the time, was a consulting physician at the hospital while sons Will and Charlie saw patients and performed surgeries. They, along with four other physicians, were the founders of Mayo Clinic. Mayo doctors consult with each other about patient care and collaborate on comprehensive diagnoses and treatment in almost every medical and surgical specialty. Since the Mayo system has 4,500 physicians and scientists as well as 57,000 health staff, most patients can receive coordinated and multidisciplinary care from many physicians and staff in a single visit. Chaplains are available 24-hours a day, and chapels in the three main buildings are always open, including worship spaces for Muslims, Jews, and Christians. There is also a new Healthy Living Center, which offers physical activity assessments, personalized wellness plans, meditation, yoga, and classes on stress relief, resiliency, and nutrition. As has happened so often in American history, the Methodists made their mark on the Mayo story as well, for the church is also God’s agent for healing of mind, body, and spirit. Twenty-three years after the Mayo’s opened their first clinic, John H. Kahler decided to build additional hospital facilities for patients near the Mayo brothers’ offices in Rochester. These buildings were a combination of hospital rooms, operating rooms, and hotels. By the early 1950’s, the Kahler Corporation decided to offload their hospitals. A group of influential citizens, including former U.S. Supreme Court Justice and Methodist Harry Blackmun (then a Mayo Clinic legal counsel), convinced the Methodist Church in 1954 to become the sponsor of these hospitals. A new 794-bed hospital was built in 1966 and was called Rochester Methodist Hospital. By 1986, Mayo Clinic, Rochester Methodist Hospital, and Saint Mary’s Hospital integrated their operations, and in 2014, they finally became one single hospital. 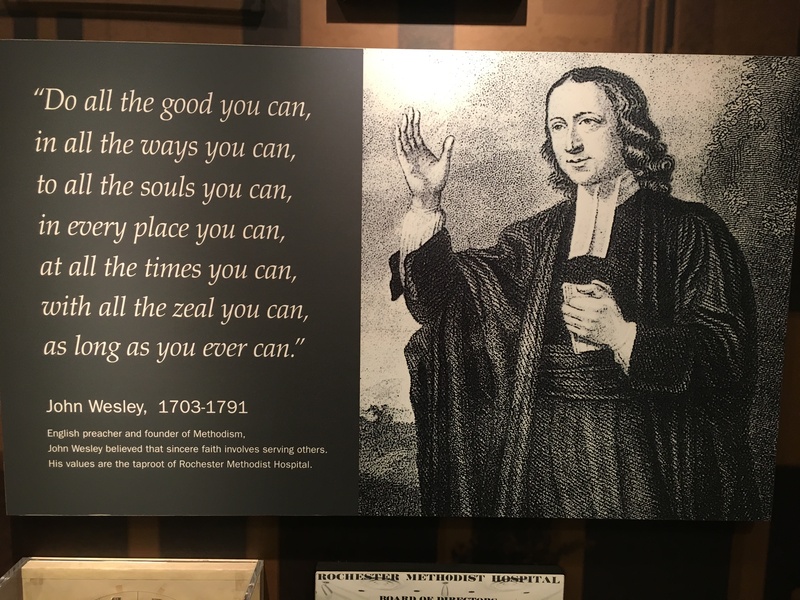 The Mayo Clinic Methodist Campus continues the legacy of John Wesley’s 1778 words. Is health care the privilege of those who can pay or a right for all? It continues to be a critical question. Who deserves health care in the US or anywhere in the world? And what obligation do governments have to care for the whole person, no matter what their financial resources might be? Living as I do in a state where funds for the treatment of mental illness have been cut so drastically that there are not nearly enough beds for those who need inpatient care, or therapists for those who need outpatient care, how will the church make its voice heard? Every single person I encountered in my two-day health program was not only excellent, but caring: from the internist, to the integrative medicine doctor, to the x-ray techs, to Sherry, the person with the unenviable task of cleaning wax from my ears. When Sherry found out what my job is, she talked about how her parents were “dumpers”; that is, they dumped her off at the local United Methodist Church on Sunday morning without going themselves. She also testified that the faithful disciples at her church modeled how to love as Jesus loved and make a difference in the world. It was a deeply touching story that only reinforced my passion for the church and the conviction that each one of us is a healer. With our faith and hope and energy, we can not only heal, but we can change the world! I pray all is well with you, Laurie. In the world we live in, health care should not be considered anything but a right. I keep asking myself, who would Jesus leave on the side line? Keep sharing your message. I look forward to Mondays. You really make me challenge myself. Your words always inspire me Laurie! Thanks for once again for your words of wisdom. I pray for answers for our health care system and all that means for us today. May God give us wisdom and solutions for what we can do together. How can we focus our faith and hope and energy on the crisis of mental health care in Iowa? Could the power of the Holy Spirit works through the Iowa conference to somehow find a way to provide more inpatient beds? More therapists? Our churches used to build hospitals, could we now do the same thing for mental health services? I was blessed to hear you at the W@W service last weekend and look forward to being a part of your first Iowa annual conference. You ministry is already a great blessing to this conference. Thank you for your words of wisdom. Hope you felt empowered and assured about your own health.